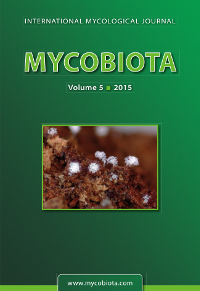 The basidiomycete Hyphobasidiofera malaysiana, described from Malaysia, has been found in Vietnam for the first time. This hitherto rarely encountered species is described, illustrated and discussed. The new lichenicolous hyphomycete species Gonatophragmium lichenophilum, found on Xanthoria parietina in Austria, is described, illustrated, discussed and compared with other species of Gonatophragmium. A key is given to all recognised species of this genus. Langdonia aristidae is reported for the first time from Madagascar, on a new host plant, Aristida tenuissima. Leucocintractia scleriae is reported for the first time from Japan. Tilletia lolioli, previously known only from Lebanon and Iran, is reported from Armenia. Nine new species of cercosporoid fungi were found on leaves of plants in family Fabaceae from the Brazilian Cerrado: Asperisporium galactiae on Galactia peduncularis, Sirosporium sclerolobii and Zasmidium sclerolobii on Sclerolobium paniculatum, Pseudocercospora acosmii-subelegantis on Acosmium subelegans, and Pseudocercospora stryphnodendri on Stryphnodendron adstringens. In addition, four other Pseudocercospora species were found on Cassia s. lat., including Chamaecrista and Senna: Pseudocercospora aquae-emendadasensis on Chamaecrista orbiculata; Pseudocercospora sennae, Pseudocercospora sennae-rugosae, and Pseudocercospora subcuticularis on Senna rugosa. Descriptions, illustrations, and discussions of the new taxa are supplemented by keys to Pseudocercospora species on hosts belonging to Cassia s. lat., and to Zasmidium species on Fabaceae.